Going to this screening seemed like a rush thing that I did not have enough background info about the movie except seeing the trailer of it a day before. I have done a short background check on the cast but only a couple of names were familiar to me. Kyle Gallner, who I remember was Bart/Impulse from Smallville.. and then there’s Emmy Rossum. I don’t think I’ve seen any of her movies but her name stands out. The names of the main characters don’t even sound close to familiar to me. Lol. Then after I watched the trailer I still didn’t get a good grasp of what the story is about aside from being a movie in the supernatural genre. “Oh, well, I’ll just let the whole movie speak for itself.. surprise me or something,” I said to myself. As it turns out, this is a film adaptation of a YA novel. 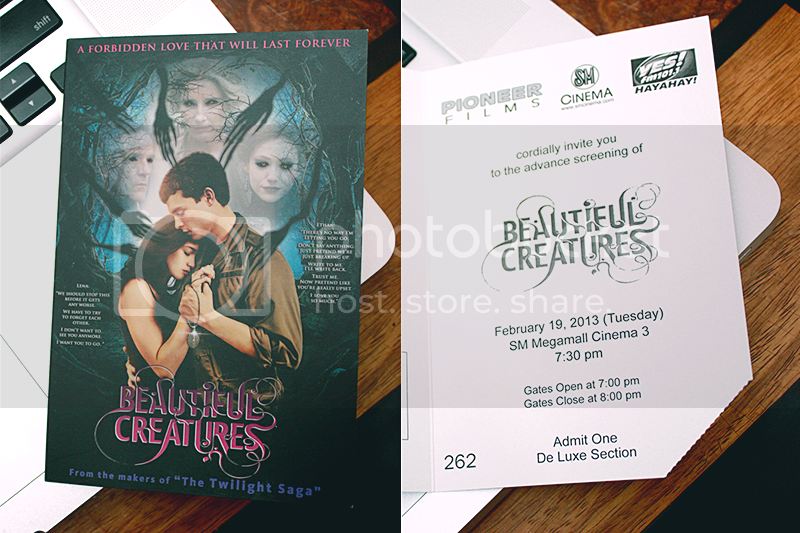 So that explains the Twilight Saga mention in the ticket, lol! BUT DON’T GET ME WRONG! Just because that Twilight is mentioned anywhere here does not mean it’s as “bad” or “awful” as that movie (somehow I can tolerate the Twilight saga movies; well, only the last 3 movies from the saga anyway; the first movie was just hilarious). Nope, there are no vampires or werewolves in this movie, if you’re wondering. The girl is not obsessed w/ the guy like how Bella is with Edward. But Ethan is a character you’d never take seriously because…. hahaha, watch it and find out for yourself. Now it’s evident that I am not a hard film viewer to please, hahaha. The next day, I did my research around the internet.. at the end of the day, I’m still left with an unanswered question about it: IS THERE GOING TO BE/ALREADY A 2ND MOVIE OF THIS IN THE WORKS?! When you get the chance to watch this in cinemas, go ahead give it a chance. Right now, I think I actually want to watch it again. I was planning on watching this film but I haven’t found the time to do it. I haven’t even read the books yet, they’ve been sitting in iBooks for a while. Maybe I will read the books after I see the film. I am unsure if it’s still showing. I guess I will check the local listings.